Bulk Bag Super Sack Unloading Loading Systems and other Pneumatic Conveying Systems are available through Thomas Conveyor & Equipment Company, Inc. Start designing your Pneumatic Conveying System today with one of our systems integrators. Heavy duty construction, industrial enamel paint finishes up to food grade FDA 2 part epoxy paint. The system is adjustable to fit 36" to 84" super sacks on our standard frame. Massaging panels paddles to promote flow to the center of the bulk bag for operator free discharge iris valves or rigid bag spout clamps for a dust free discharge of product. 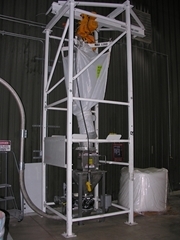 Self cleaning reverse pulse jet dust collectors mounted to the super sack frame and return dust into the discharge hopper. Numerous discharge hopper designs to suit the flow characteristics of your powder, granular, free or semi free flowing ingredients.